50/50 is about Adam, a radio writer whose girlfriend Rachel stays with him most nights. He also likes hanging out with his best friend Kyle who often gives him a ride to work since Adam can’t drive. I like Adam ‘cos he’s quite quiet and chilled out and like me he doesn’t smoke, drink or drive. One day he goes to the doctor about a recurring backache and the doctor tells him he’s got schwannoma neurofibrosarcoma. Adam’s reaction is just what you’d expect “So sorry… I don’t know what that is”. The doctor tells him it’s cancer, and after that Adam doesn’t hear anything else he says. Katherine. 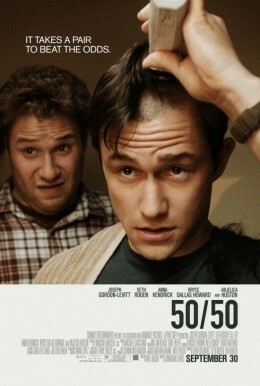 The rest of the film follows his live in the aftermath of his “50/50” diagnosis. diagnosed with a serious form of cancer and undergo treatment is really intense and kind of exhausting. Kyle’s irreverent humour is the perfect foil for the dark hopelessness of what Adam’s experiencing. He’s a really good friend. He drives Adam to his hospital appointments but he also persuades him to use his cancer to pick up chicks. I’ve said it before and I’ll say it again: there aren’t enough positive male relationships in movies, but I think this is one. This film is definitely one of my top two cancer movies of all time. That’s right, it’s right up there with Wit. The back of the DVD case (which I didn’t read ’til after the movie, thank goodness) calls the film a “laugh-out-loud comedy” and both its Oscar nominations (best movie and best actor) were in the ‘Comedy or Musical’ category. That’s messed up. I mean, sure, I LOLed. But I don’t think that makes it a comedy. I also cried. I think it’s more of a “drama”, myself. But what do I know? I haven’t had cancer. If you think this sounds like your kinda movie, I highly recommend getting it on your next trip to the DVD rental store. But I do not recommend reading the back of the DVD case, it totally gives away the ending.